The Klipsch X20i is Klipsch's top of the line model. And I can see why. The X20i is part of their Reference series, and their top of the line, for good reason. While it is only a 2 way model at their $549 price point, the way that they designed integrated the two balanced armature drivers is supposed to bring stellar sound. The Klipsch X20i came shipped in a nice box with a paper sleeve with photos and specs for the IEM. The sleeve wrapped around a very cool wooden box, that is held shut with magnets, which gave a very elegant touch and feel. This is clearly their flagship model! Opening the box revealed the IEM, owners' manual, a leather case with magnets to hold it closed, and one of the credit card sized plastic eartip holders. The quality of the materials used was very good, comprising of some molded aluminum, and plastic. The quality of construction as well as the fit and finish was equally impressive. The Klipsch X20i seemed to do everything right. The cables were very high quality, comprised of twisted strands inside a plastic sheath. There is an in-line mic and controls for your smartphone. The cables are also detachable, and the way they do so I think is a bit more durable. David Bowie: Let's Dance, bass had good depth and authority, percussion was crisp and dynamic. Knocker sounded woody and showed a wide soundstage. Very nice resolution in the cymbal. Vocals had nice detail and smoothness. Journey: Don't Stop Believing, the keyboard sounded extremely natural, vocals were smooth like honey with lots of resolution and texture. Percussion had crisp cymbals and nice low end extension in the kick drum. Also Sprach Zarathustra, revealed good low end extension with lots of authority. The silky smooth brass wasn't too brassy. Very good resolution in the tympani. Junior Wells: Why are People Like That, the vocals were extremely natural and smooth, harmonica was dynamic and provided a musical experience that has to be heard to be appreciated. The resolution provided was life like. Gershwin: Rhapsody in Blue, provided excellent clarinet tone, and lots of resolution so you could hear the breathing technique, with air and woodiness of the reed. Piano sounded extremely natural. Brass was as smooth as honey with excellent dynamics without coloration. Bassoon had amazing texture. Low level harmonics was very nice, as was the imaging and large soundstage. They performed some serious magic to get sound this good from a 2-way balanced armature driver system! It's dual balanced armature drivers provided a lifelike sound that was silky smooth, refined, and a bit warm, and so silky smooth! And I loved the level of resolution that they provide! The housing is actually very small. So if you have small ears, they are much easier to get a great fit! And for those not so small ears, they have larger sized eartips to help you get the right fit. I could not believe the level of sound provided by 2-way monitors!!! 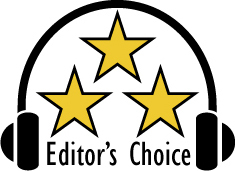 Based on their design, features, quality, and performance, the Klipsch X20i has earned our Editor's Choice Award. For more info and complete specs, check out their website at www.klipsch.com.